Height W/Chain 5" , Length:- 1.5"
This Key Chain Is beautiful crafted from solid brass key chain chain a beautiful shine and features a round split key ring.. These key chains can serve as a very sophisticated and timeless gift for special occasions. This is a rare piece is made in solid brass with excellent finishing. 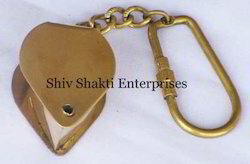 These Brass Magnifier Key Chain Approximate Measures 5"L (with Chain) The Magnifier itself measures 1"H x 1.5" in diameter. Available in brass finish, antique finish, black finish, patina finish, nickel plated finish. We are one of the significant manufacturers and traders of Key Chain that is exceedingly perceived for its strength and convenience. Made accessible in a few plans, sizes and shapes, these key chains are incomprehensibly cheered around our esteemed clients. Further, these lightweight and erosion safe key chains are given at business heading costs. Magnifying key chain is made of brass, this magnifying lens is nice quality. A best gift for collectors. It is used for magnification item. Add a periodic touch to the keychain by presenting this magnifying glass keychain.